This weekend heralds the start of a great Liverpool musical comeback.Whats that you ask? Flock of Seagulls? Atomic Kitten? Our Kid? No you crazy fools! TICKLE THE IVORIES is back and I needn’t spin the sequel by claiming its bigger, bolder, with more stunts and car chases and all that malarkey because it really doesn’t need it. 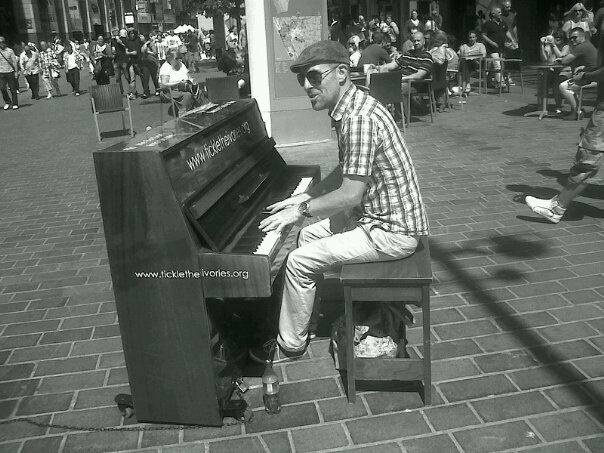 With five pianos dotted around the L1 shopping district , dozens of different pianists and entertainers will be the star of this years summer blockbuster and for anyone who missed it last year then you really will be in for a treat. The Acts vary from Choirs, duets, quartets, classical, cabaret, singers songwriters and your lowly busker types like myself who were lucky enough to take part in last years event and are equally honoured to take part this year. The real beauty of this initiative, which is the brainchild of the hardworking gals at Open Culutre is that it is inclusive to anyone who wishes to dip their toes in the performers pond regardless of experience. There will be at any given time a FREE PLAY piano for a passer by to play at their leisure. Last year I witnessed on several occasions a shy young child out shopping with their parents tentatively take a seat at a free play piano and then amaze the shoppers with an accomplished tune after which the child would usually look up , notice the crowd that had gathered and then bolt, ushering their proud parents to match a twenty mile an hour sprint away, overwhelmed by the reaction but nonetheless boosted in self esteem. It was truly the highlight of my Summer last year both as a player and a shopper and it had me cast aside all my untrained anxieties and just embrace the whole spirit of entertaining people as best my limitations would allow. I know that this year will be no different. Not having to be bigger, nor bolder, no stunts. Car chase not required. Cannot get to your Sunday gig, are you doing any others, let me know.